Painting By The Numbers, We shouldn’t judge quality of fine art by the dollar amount being paid by a collector” but we can’t help but be interested after The Scream went for $120 million. In early May, Munch’s The Scream was sold by Sotheby’s for $119.9 million, making it the highest price achieved for a painting to date at public auction. The image depicts an open-mouthed figure holding its hands over its ears while standing on a boardwalk beside the sea under a vivid orange and yellow sunset. It is probably the most recognisable artwork after the Mona Lisa. It has achieved its fame through countless pop-culture spin-offs, parodies and reproductions on coffee cups, T-shirts and other paraphernalia. In addition, two of the other four versions have been stolen in the past and Ladbrokes was offering 20/1 against this one being stolen before the sale. The location Munch chose for the painting was a popular suicide spot on Oslo’s seashore that the artist used to visit. On one side was a lunatic asylum, where the artist’s schizophrenic sister was housed, and on the other was a slaughterhouse. The screams of the lunatics intermingled with the terrified bellows of the animals being slaughtered. To ensure there was to be no confusion as to his mood, the artist helpfully inscribed a poem on the back of the painting: ‘I was walking along the road with two friends, the sun was setting. The sky turned a blood red and I felt a whiff of melancholy. I stood still, deathly tired – over the blue-black fjord and city hung blood and tongues of fire. My friends walked on – I remained behind. Shivering with anxiety, I felt the great scream in nature.’ The poem is in keeping with the fatalistic fin-de-siècle mood inspired by writers such as Nietzsche. The subject matter of the painting is perfect for the taste of today, and it was always going to sell in excess of the Sotheby’s estimate of $80 million. The emotions are so obvious, the painting such a statement, the subject instantly understandable in this narcissistic age which requires entertainment designed for the lowest common denominator. Collectors today talk of impact and wall power, whereas their forebears sought out subtlety and sophistication. Today, Richard Prince’s Nurses and Warhol’s Marilyns have replaced Rembrandt’s portraits or Vermeer’s interiors. As to who bought it, for the time being they are keeping that information to themselves, but it will probably emerge in time. All the usual suspects have been suggested, including Paul Allen, Roman Abramovich, the Qatari royal family, a Norwegian taking it home and even a Chinese collector who was definitely in the bidding. Sotheby’s marketed the painting extensively before the sale and toured it around the world, physically putting it on the walls of collectors’ homes as far afield as Hong Kong. Its work paid off with the enormous price and it said it earned $12.9 million in commission. The sale is interesting because the work is a pastel. Until recently, works on paper were much less valuable than oil paintings, but watercolours by Cézanne, drawings by Raphael and now a pastel by Munch have made huge prices, showing this bias no longer exists. If the buyer is from one of the emerging art-buying nations this will accentuate the trend that shows the top end of the art market moving east. Art Market Trends 2011 reported that China currently has 41.1 per cent of the world’s art auction revenue, the USA 23.6 per cent and the UK 19.4 per cent. Of the ten bestselling artists in 2011, six were Chinese. These new buyers are drawn to the art market because it is an exciting marketplace that they can now participate in, it draws people to their new museums, such as in Qatar, and they believe it is a good investment in these unsettled times. The Mei Moses Fine Art Index shows that art has outpaced the S&P with an average annual return of 7.8 per cent, compared to 2.7 per cent for the S&P over the last ten years. 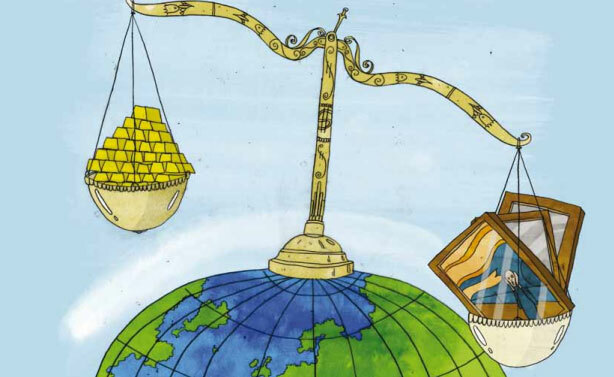 Emerging market buyers are paying top prices. In 2006, the Mexican collector David Martinez is believed to have bought Jackson Pollock’s No. 5, 1948 for $140 million from David Geffen. The same year, Boris Ivanishvili, the Georgian businessman who is building a museum in Tbilisi, bought Picasso’s Dora Maar au Chat for $95 million at auction. In 2007, Joseph Lau, the property developer from Hong Kong, is believed to have been the buyer of Warhol’s Green Car Crash – Green Burning Car for $71.7 million. Roman Abramovich arrived in the art market in 2008 and immediately made his mark, buying a Francis Bacon Triptych for $86.3 million, while in 2010 the Brazilian-born Lily Safra bought Giacometti’s Walking Man I for $104.3 million. In May 2011, the Chinese mainland collectors Liu Yiquan and his wife Wang Wei from Shanghai paid $65.5 million for a work by the Chinese artist Qi Bashi. As recently as ten years ago, the leading art buyers were European or American. The most expensive painting sold in 2002, for example, was Rubens’ Massacre of the Innocents, acquired by the Canadian businessman Kenneth Thompson, for $76.5 million at Sotheby’s in London. 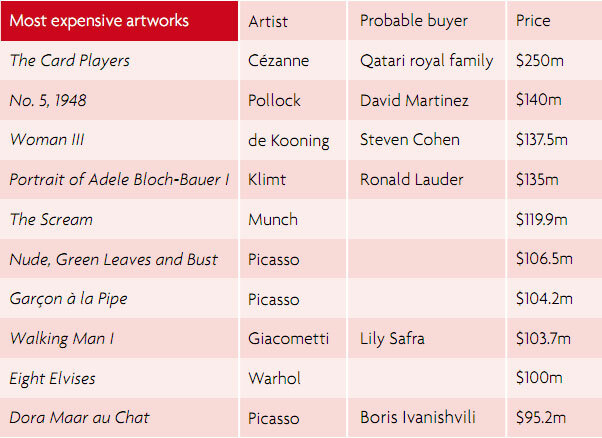 The chart to the left illustrates a probable list of the top ten prices for artworks achieved since then, and their buyers. It will be interesting to see where The Scream ends up. Perhaps its owner will remain anonymous but, unless they are going to keep it in a vault, it seems likely that the painting’s location will become public knowledge at some point. However, amid all the hype and hubris about these record prices, the middle and lower ends of the art market are suffering in this recession and will likely weaken further. On 10 May, Sotheby’s revealed its Q1 results, which showed a $10.7 million loss, based on a 23 per cent drop in works sold over $1 million and a 29 per cent reduction in net auction sales from the prior quarter. The strategy for collectors should remain the same – buy the best of whatever field you collect if you can afford it and are in it for the long term… or steer clear. Very interesting. Really shows the tectonic shift in the art market in the last ten years. Always valuable and insightful advice and commentary by a true expert in the field of fine art buying and selling and investing. I look forward to your aricles in SPEARS and it is exciting to be able to read it here first! Thank you for your contributions to the fine art field!